Following its Stadia keynote at the Game Developers Conference, Google opened up some demo kiosks to show off exactly how games look and feel while streaming on the service. After spending a bit of time with the service and hearing more about the tech powering it, I can safely say that it’s incredibly impressive, although there are a number of caveats to consider. 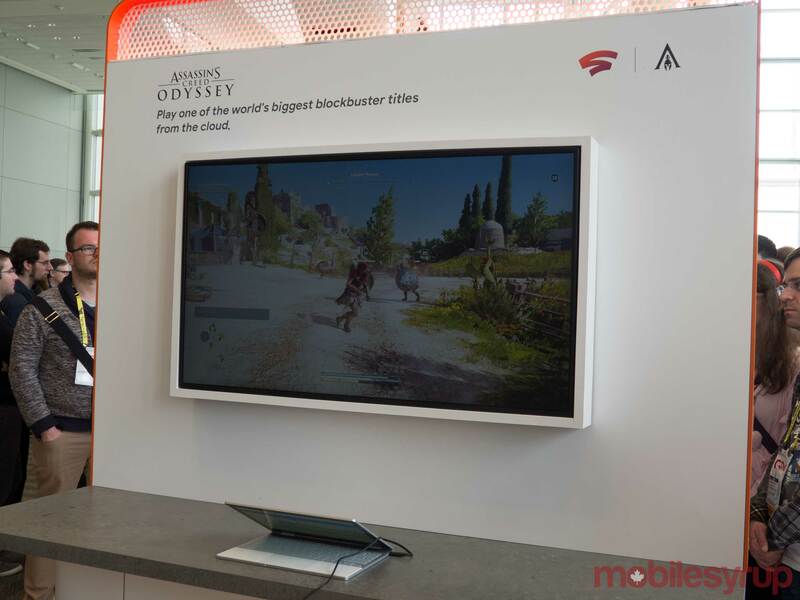 In these show floor demos, Google was featuring Ubisoft Quebec’s acclaimed 2018 action-adventure game Assassin’s Creed Odyssey. This was particularly appropriate given that Google’s first public tests for game streaming — which took place last fall under the name ‘Project Stream — were focused on Odyssey, specifically. However, these tests were limited to select U.S. users, meaning that no one in Canada or other countries could try the service for themselves. The idea behind Stadia is to break down hardware barriers by letting players stream games to virtually any modern device, regardless of specs. In my demo, I got to play on a Google Pixelbook that was streaming Odyssey through a Chrome browser. The kiosks were connected to a wireless network in San Francisco’s Moscone Center that was itself connected to a Google data centre somewhere within the area of the city. Because Odyssey is an open-world filled with all kinds of activities, I wanted to try out as much as I could. Therefore, I ran a bit of a gauntlet of gameplay types, ranging from cross-country horseback riding, skirmishes with Spartan troops, climbing a tall mountain and sailing on my ship. Impressively, I only noticed a brief and minor drop in visual fidelity when opening the world map as Stadia was buffering. Otherwise, the game played a seemingly near-constant 1080p, 30fps, even in instances like multi-ship naval battles where a lot was going on at once. Having put nearly 60 hours into Odyssey over the past several months on the Xbox One X, I was pleased to see my Stadia experience play out nearly identically, outside of the 4K resolution. I also didn’t run into any noticeable input lag, which kept the moment-to-moment gameplay smooth and near-indistinguishable from my console-based experience. That said, my demo was also only playable with a third-party Logitech controller, so I wasn’t able to try out Google’s dedicated Stadia Controller. The controller — which was developed partially by a team from Waterloo, Ontario — offers a number of features that are core to the Stadia experience, such as built-in Google Assistant functionality for instant game support via the internet or a share button to let players watch and interact with your game streams. Outside of Odyssey, I also watched an id Software developer play some of the upcoming Doom Eternal first-person shooter via Stadia streaming to a Pixelbook. In some ways, Eternal is the perfect test of Stadia’s capabilities due to its action-packed gameplay focused on speed and movement. In practice, though, this proved to be a bit more difficult for Stadia to keep up with than Assassin’s Creed Odyssey. As you can see above, there are a few brief stutters in streaming as the developer ran through his shooting gauntlet. For the most part, the demo looked and ran great, but it remains to be seen if those hiccups will be a bigger problem in a complete game. Outside of game demos, Google was also showing off some of Stadia’s developer- and community-focused tools at these kiosks. In terms of the former, Google let me try out Style Transfer ML, its machine learning tool that can re-skin an environment with map textures and colour palettes based on scanned photos and artwork. The demo featured seamless integration of assets with a variety of themes, including a greyed-out world, a paper-inspired aesthetic and even a black and blue style taken straight out of Pac-Man. Impressively, all of this was applied instantly as I was running around. Unlike Odyssey or Eternal, though, this was all featured not in a full AAA game, but rather a proof-of-concept tech demo set in a small, largely barren environment. As a result, it’s too early to say how it will work in a full-length game or if it’s even something that many developers will use. The show floor also featured a kiosk for Stadia’s Stream Connect feature, which aims to bring back split-screen couch co-operative play in a big way. In recent years, developers have had to make concessions to implement split-screen modes, which has led some studios to stay away from the feature entirely, such as 343 Industries with Halo 5. However, Stream Connect was only shown off through pre-recorded tech demo footage, so I wasn’t able to see how it fares firsthand. Google isn’t yet ready to fully pull back the curtain on Stadia, however, leaving us with many questions. To start, the tech giant hasn’t confirmed pricing for Stadia, so we don’t know how much we’ll have to pay for the controller or streaming service. Further, Google promises that Stadia will support 4K HDR, 60fps gameplay when it launches sometime later this year, although that remains untested for the time being. What’s more, only a select few games are being shown off right now, so we don’t know how robust of a library Stadia will have. Most importantly, it’s unclear how Stadia may serve people with technical limitations stemming from low bandwidth, a slow router or being located in a rural area. In spite of the many questions that remain about Stadia, though, I’ll be leaving GDC with even more optimism for the future of gaming. By combining hardware-agnostic streaming, a suite of developer tools and content creator-friendly community features, Google is well-positioned to create a welcoming and thriving gaming ecosystem. Bearing in mind that cloud technology has a ways to go before it becomes standard, Google Stadia is poised to usher in an exciting new era of gaming. We’ll have more on Google Stadia in the coming days.